is designed to meet these requirements. It’s a fully managed, highly scalable, strongly consistent processing service for both batch and stream processing. It merges batch and stream into a unified programming model which offers programming simplicity, powerful semantics and operational robustness. The first two of these benefits are properties of the Dataflow programming model itself, which Google released in open source via a SDK, and is not tied to running on Google Cloud Platform. Today, we’re announcing another deployment option for your Dataflow processing pipelines. 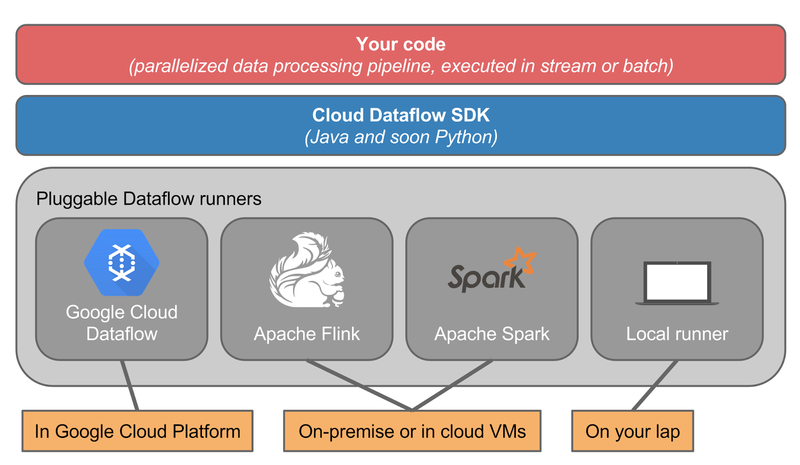 The team behind the fast-growing Apache Flink project has released a Cloud Dataflow runner for Flink, allowing any Dataflow program to execute on a Flink cluster. Apache Flink is a new Apache Top-Level project that offers APIs and a distributed processing engine for batch and stream data processing. By running on Flink, Dataflow pipelines benefit not only from the power of the Dataflow programming model, but also from the portability, performance and flexibility of the Flink runtime. It provides a robust execution engine with custom memory management and a cost-based optimizer. And best of all, you have the assurance that your Dataflow pipelines are portable beyond Google Cloud Dataflow: via the Flink runner, your pipelines can execute both on-premise (virtualized or bare-metal) or in the cloud (on VMs). For more information, see the blog post by data Artisans, who created the Google Cloud Dataflow runner for Flink. We’re thrilled by the growth of deployment options for the portable Dataflow programming model. No matter where you deploy your Dataflow jobs, join us using the “google-cloud-dataflow” tag on StackOverflow and let us know if you have any questions. More and more organizations have learned, through experimentation, how much latent value exists in large scale data and how it can be unearthed via parallelized data processing. Bringing these practices into production requires faster, easier and more reliable data processing pipelines. Google Cloud Dataflow is designed to meet these requirements. It’s a fully managed, highly scalable, strongly consistent processing service for both batch and stream processing. It merges batch and stream into a unified programming model which offers programming simplicity, powerful semantics and operational robustness. The first two of these benefits are properties of the Dataflow programming model itself, which Google released in open source via a SDK, and is not tied to running on Google Cloud Platform.